Madame Noscova’s Moscow Mission is the sixth episode in the micro-series, Dolls are Different…or are they? a pegdoll production. The Doll community has wedding planning fever! Family and friends, both old and new, are busy thinking up ways to contribute to the wedding day of Peg & Pog. The suggestions and ideas come thick and fast from family and friends on what should happen on their wedding day. They are not sure that they can cope with any more ‘helpful’ ideas. Madame Noscova, that exotic Russian ballet teacher is excited! She is busy planning for the newly-formed break-dance ballet group, the Beat Belles, to dance at Peg & Pog’s wedding. Peg & Pog really do not know what to say to an exotic Russian ballet teacher, not having previously met one! Before Peg & Pog know it, Madame Noscova and the Beat Belles decide on their contribution to the celebrations! Madame Noscova declares that she needs inspiration! She must visit the home of the Bolshoi Ballet in Moscow, Russia. 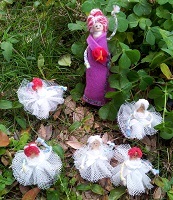 Anjeanette, Anjoane, Anlouise, Anmarie and Antenile, Madame Noscova’s ballet class, who with DP, Peg’s little 8-year old brother, form the Beat Belles, decide that they also need inspiration. After all, they are the ones who bring Madame’s inspirations to life in their dance steps! DP, ever the dedicated artist, stays home to improve on that famous break-dance move, the ‘Orbital Rotation’. Pog performs the ‘Orbital Rotation’ in his break-dancing moments. This is the move that Pog demonstrates to DP at Peg & Pog’s first meeting in the Rose Garden, and DP is keen to invent his own ‘busting’ move that is impressive. Madame Noscova and the rest of the Beat Belles take off on their Moscow Mission for inspiration! Adventure, excitement and delightful scenery await the little travellers. They cover long distances in the air, on the water, and over land to reach their destination. They are fearless and dedicate themselves thoroughly to the task. At last, ‘inspiration’ is within their sights! Madame Noscova and the Beat Belles find their inspiration at the Bolshoi Theatre in Moscow. 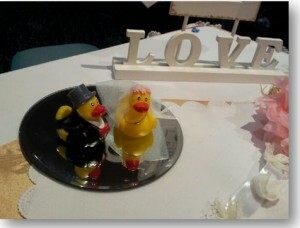 Peg & Pog are excited and happy to share their delightful wedding album with you. The newlyweds, Peg & Pog, love their official wedding photos and present them in their delightful Wedding Album. Peg & Pog and all the Doll family members and friends who help make their special day in the Rose Garden just the best, feature in the official Wedding Album. This unique wedding album captures the excitement and joy of the day. Peg & Pog choose Glenda J Ashleigh, Brisbane’s Very Good Celebrant for their wedding ceremony. Peg & Pog, the Bride and Groom, star on their special day! 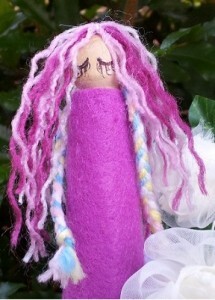 All Dolls feel the love and pride in the efforts to make the wedding day one to remember. Peg & Pog feel happy that they achieve all their hopes and dreams for the wedding they want! 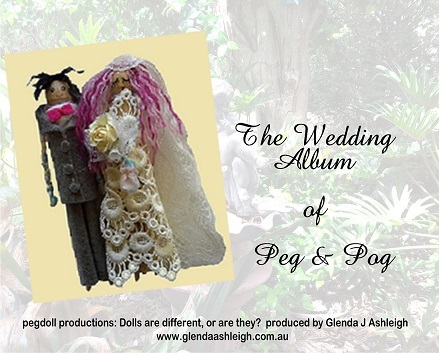 Peg & Pog star in the micro-series “Dolls are Different…or are they?” Wedding planning is pretty rough sometimes, and Peg & Pog share their many experiences with you! Fortunately, they choose Glenda J Ashleigh as their Celebrant and the wedding day arrives and all is beautiful in the Rose Garden. 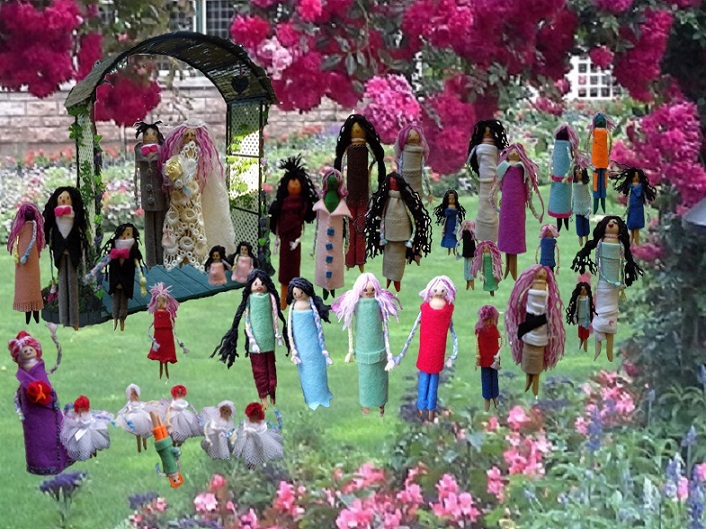 Peg & Pog marry in their dream wedding in the Rose Garden. Doll family and friends rejoice in the celebrations and happiness is everywhere. 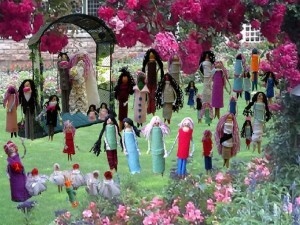 The Rose Garden is a busy place where the Doll families gather to plan for Peg & Pog’s special day. 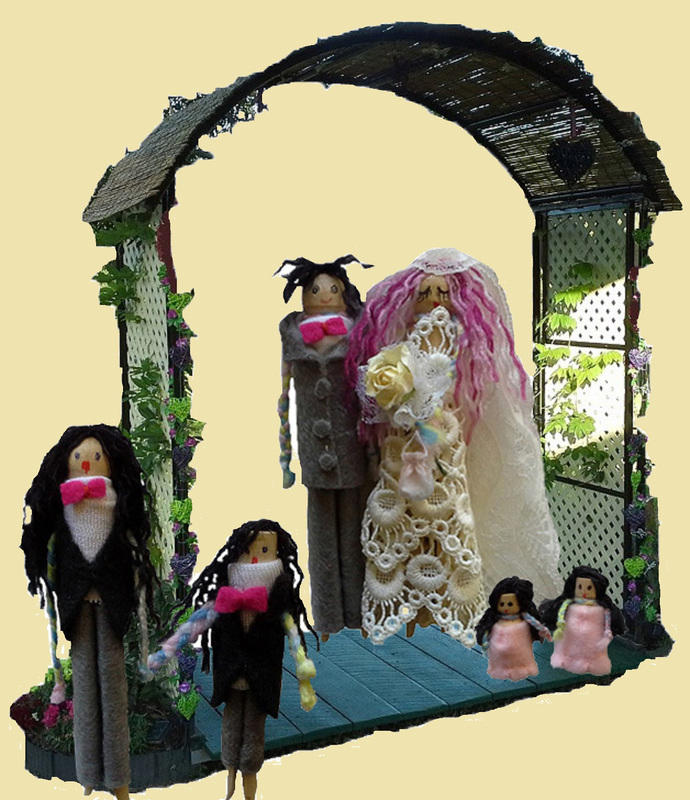 Of course, all dolls want to ‘help’ make Peg & Pog’s wedding the very best. Unfortunately, there is no accounting for taste, and the various members of the Doll families do not disappoint. Left to the families, the wedding will be nothing short of ‘memorable’ – something that Peg & Pog are not too sure about! Wedding standing places are very confusing especially when everyone is busy with their own ideas about what should be happening. Molly & Polly present their menu of delightful, tasty treats that are sure to please. Meanwhile, Dickie & Pago are busy with their ‘creative’ talents, and DP also wants to get in on the action! Where do we stand for the wedding? The Bride and Groom, and their attendants need to know where they stand during the wedding ceremony. Peg asks a simple question, but no dolls are listening !!! Peg is very patient, being the sweet-natured girl that she is, however there is a limit. When Peg asks a simple question, she expects to get a simple answer. 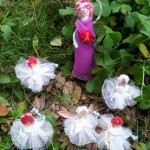 Meanwhile, all dolls are excited and are too busy with their own activities to pay any attention to the bride-to be! The twins, Pip & Pepper have fun with their new friend, Big Bee, and Madame Noscova (and the ballet class) makes an entrance! DP finds his creative side and joins the ballet. Disaster strikes Pog and confusion is everywhere! Peg & Pog find it all too much and decide to take things into their own hands. At last, fortune strikes, and Peg & Pog find a really good Celebrant. 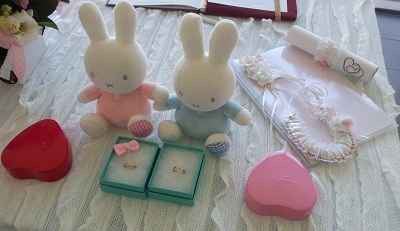 The wedding ceremony planning flows smoothly and Peg & Pog look forward to a delightful day. The path of true love never does run smoothly, even in Doll families! When Doll family members get the great news of Peg & Pog’s engagement, they spring into action! Family wedding planning is not a simple activity. Everyone wants to have a say. Ideas come thick and fast – culinary delights, creative pursuits and special talents are offered as the excitement grows. All is not plain sailing in the wedding planning department. Peg & Pog feel that they are being ignored in the planning for their wedding by the eager members of their families and newfound friends. Peg & Pog ask the question, “Whose wedding is it anyway?” as they experience the ‘help’ that their families are so keen to offer. Peg wants her wedding day to be a happy occasion. She has her dreams and loves to picture how she will look on her special day. Not only does Peg want to look like a princess, she also wants to surround herself with the beauty of nature. 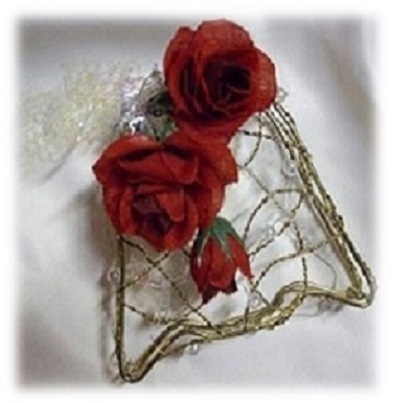 Weddings are romantic and Peg loves those unique, little touches that bring joy and delight to the day. Pog hasn’t thought about his wedding day very much. After all, he hasn’t been married before, so he doesn’t quite know what he should think about. Pog wants to make his wedding day the best day ever, however thinking takes time, effort and patience. Getting married is a serious business and a wedding is an event that needs to be planned carefully. Neither Peg nor Pog know about the ins and outs of planning a wedding and the task is starting to give Pog, in particular, a headache. How do they plan a wedding that everyone will enjoy and feel included? Do they risk hurting feelings and insist that things are done their way? Do they try to please everyone, or do they elope and avoid all the fuss? It all gets a bit too much for Peg & Pog. They decide to regroup and think about what they want for their special day. What are their ideas, their dreams, their wishes? Peg & Pog retreat to their ‘secret place’ for some peace and quiet. Time to smell the roses and relax.